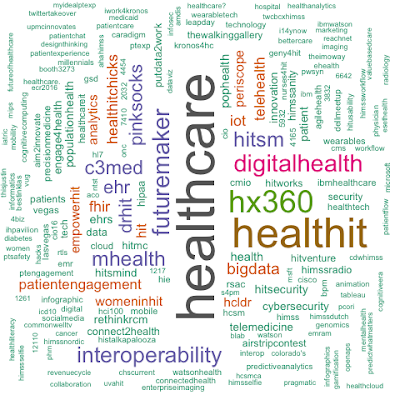 In reviewing the list of healthcare IT predictions for 2016 one trend stands out among the closely-related topics of devices, wearables, the Internet of Things, and mobile health (mHealth). Experts predict explosive growth in this category, only questioning how soon we can expect to see an impact. Chilmark predicts mixed success in 2016;IDC forecasts that 80 percent of patient interactions will use device data in some way by 2018. How can clinicians cope with the volume, relevance and variable reliability of patient generated data? What standards should be used to ensure that electronic data flows smoothly? How can privacy and security be protected as data-gathering devices become ubiquitous? How to address other considerations, including durable patient consent, governance models, accountability and oversight? A recent study found that bolstering traditional disease management practices with device data resulted in no improvement in patient outcomes. Among the possible explanations for this counterintuitive result, is the immense volume of data and how to best use it. Hospitals and other clinical settings generate enormous quantities of data. For example, a patient’s vital signs may be recorded hourly during a hospital stay or nearly continuously in an intensive care unit. While this data is critical for the duration of the episode, its long-term value is relatively low. A patient’s heart rate at 3:30 p.m. on the second day of a hospital stay is still useful 15 minutes later, but after two years that measurement is just clutter. Imagine how much worse the problem will be if all patients take their own measurements on a daily basis and transmit them to their electronic health records. A constant stream of data is great for identifying patterns, trends and impending problems. Unfortunately, the clinical relevance of the data itself is practically nil. Before device data – particularly consumer device data – can become useful, it’s necessary to determine what data to save, how long to save it, and how to automatically detect patterns. One side effect of the profusion of medical and consumer devices is that it can be difficult to move data between and among the various systems that need to manage it. The wide variety of manufacturers results in differing data formats, transmission protocols, and units of measurement. One way to manage the variety and complexity is to restrict choices to specific brands or models of devices. This is an effective strategy for showing reliable results during a limited pilot project, but the practice does not scale and hinders innovation. Open standards are fundamental to a robust ecosystem. They’re the best way to avoid data silos and vendor lock-in. Standards organizations are beginning to address these issues, but in the near term, challenges surrounding device data management and interoperability will continue. "Data is a toxic asset"
As Bruce Schneier recently opined, data is a toxic asset. The prevailing practice is to retain the maximum amount of data because storage is cheap, and unforeseen uses of the data may be valuable. However, the illegitimate uses of data far exceed the desirable uses in number and value, so warehousing electronic data can be a major liability. This is particularly true with consumer devices, which are numerous, network-connected, and filled with data that can easily be combined with other public and pilfered data sets to create a shockingly complete profile of the victim. The National Science Foundation has stressed the importance of mHealth security by granting $10 million to help solve the problem, and UL is planning a certification program for wearables to improve safety, privacy and security. Providers and payers will be reluctant to incorporate consumer device data into their systems without the assurance that they’re not exposing themselves to a potential breach. Clinical devices, mHealth, wearables and the Internet of Things hold immense promise for improving healthcare delivery and population health. We’ll likely see good results from pilot projects and studies in the near future; however, the industry needs to show significant progress in addressing the hard questions around security, interoperability and utilization of the data before widely adopting these new technologies. My previous blog post previewed the HIMSS 2016 Conference and Exhibition based on the selection of educational topics on the agenda. 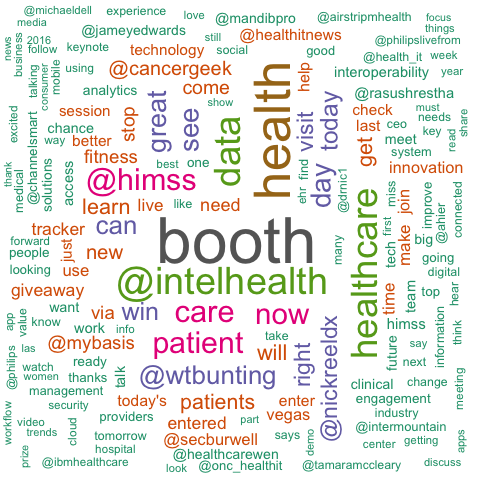 With HIMSS16 behind us, it’s time to look back to see which topics actually created the most buzz. A look at the Twittersphere provides a way to tap into the conference’s zeitgeist. 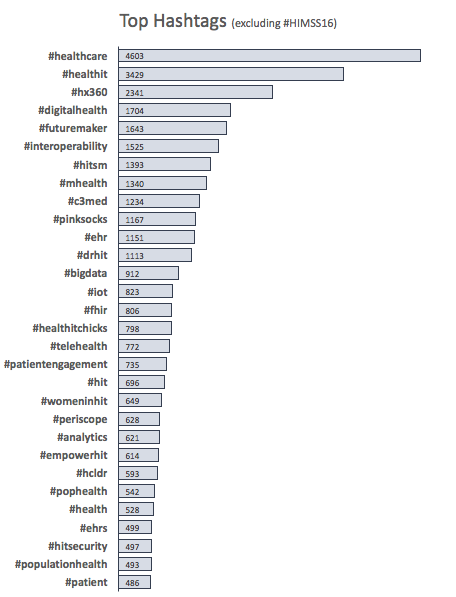 For this analysis I downloaded over 82,000 tweets tagged with the official conference hashtag, #HIMSS16 starting at midnight on Monday, February 29 through Thursday, March 3 (ending just before midnight). 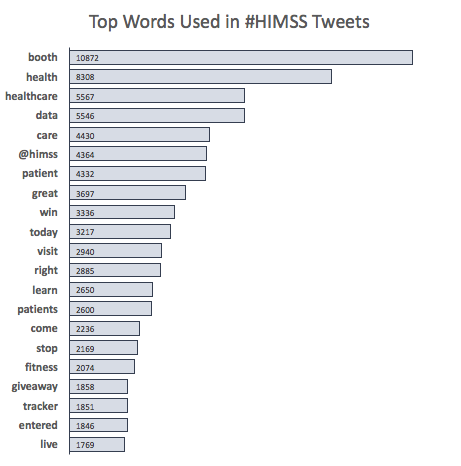 A quick look at the words used in #HIMSS16 tweets makes it clear that vendors dominated the conversation imploring attendees to visit their booths. This is probably in line with expectations, but it’s not especially interesting content for most readers. 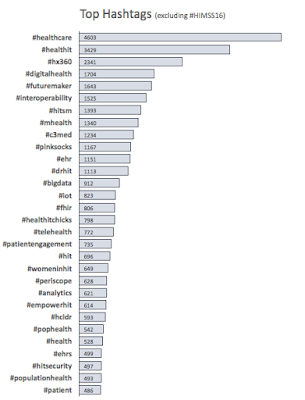 Looking at additional hashtags included with #HIMSS16 provides a more topical view of the conversation. 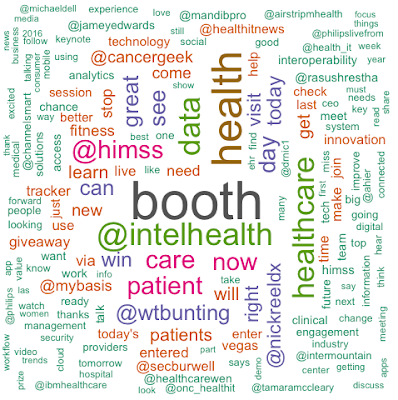 The conclusion from these first two breakdowns of the data is that the HIMSS conversation on Twitter was dominated by vendors seeking booth visitors. Attendees visiting these booths expected to learn about a wide variety of subjects, which weren’t always in alignment with the topics of the educational sessions. 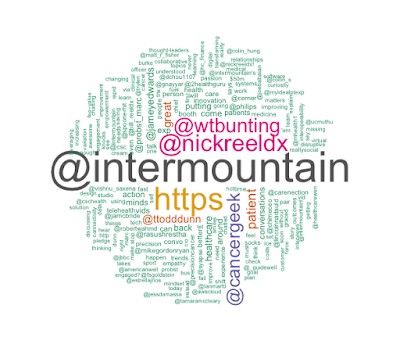 Intermountain Healthcare – How to Do Twitter Right! 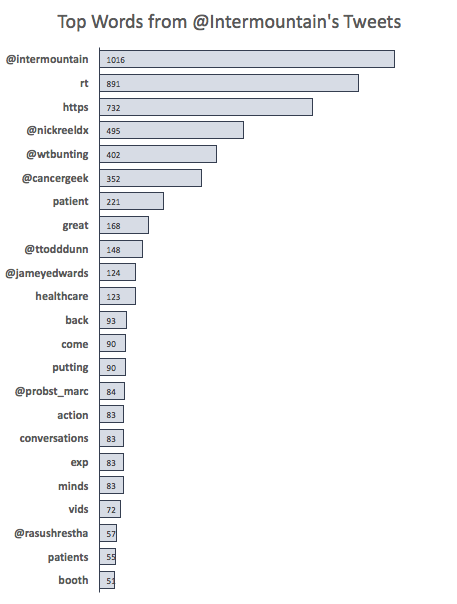 One of the highest-ranking Twitter accounts among the week’s tagged tweets was @Intermountain, the Twitter handle for Intermountain Healthcare. An analysis of their tweets reveals a different pattern emerging when compared to the conversation at large. 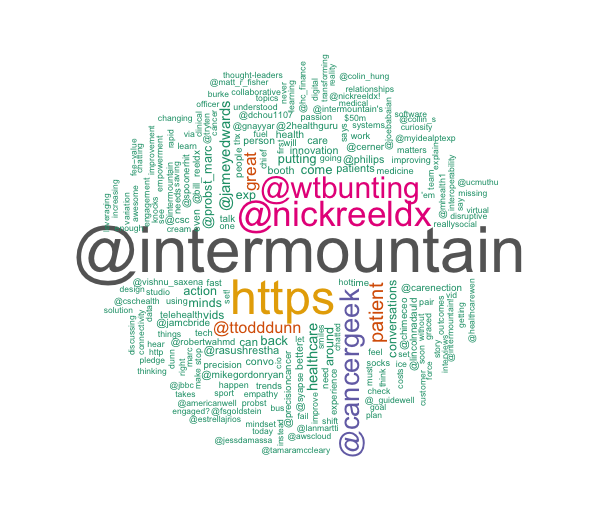 Next year I plan to shift my focus away from the #HIMSS17 hashtag and instead follow a small group of bellwether organizations, like @Intermountain, that provide a value-added curation of the broader tweet stream. 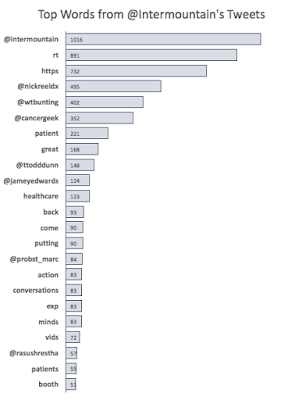 I conducted the analysis for this article using R and the twitteR package, which uses Twitter’s APIs to download messages. I created the word clouds with the R Wordcloud package. I did quite a lot of the text processing and cleanup in TextWrangler for Macintosh. All those abbreviations, emoticons and punctuation marks that are easy to read in tweets take a long time to clean up for computer analysis! Microsoft Excel produced the bar charts.